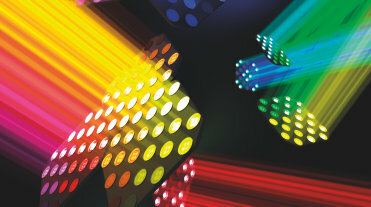 It´s showtime for OSRAM Opto Semiconductors´ OSRAM OSTAR Stage Family. These LEDs are ideal for moveable stage lights, known as moving heads, which provide powerful light beams for rock concerts and other impressive lighting arrangements. This OSRAM OSTAR® Stage gives customers more flexibility for their stage product portfolio. Moving Heads for example can use the same number of new LEDs and will be even more powerful, and Fixtures with fewer light emitting diodes will have the same total brightness but fixture could be smaller. 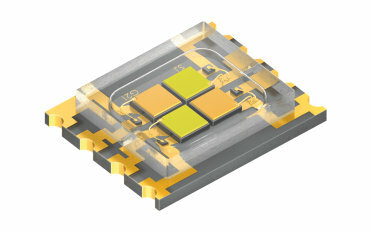 OSRAM OS is now able to offer a full range of 15W, 30W and 60W RGBW Stage LEDs. The new 30 W version of the OSRAM OSTAR® is developed for spotlights and moving head applications. For the first time it contains a yellow chip in addition to the three primary colors. The special feature of this OSRAM OSTAR® Stage is its tunable white light color. Two warm-white and two cold-white chips, arranged diagonally in the package, not only enable colors to be mixed perfectly at component level but also allow all white tones between color temperatures of 2700 Kelvin (K) (warm white) and 10,000 K (cold white) to be produced with appropriate control. The LED achieves a high color rendering index of 94 for warm white and 74 for cold white. Instead of the usual lens, OSRAM OSTAR® Stage LEDs have a flat glass cover with an anti-reflective coating, giving the LED a much flatter profile. It is now only 1.23 mm high – one quarter of the usual height. Spotlights can therefore be made much more compact. 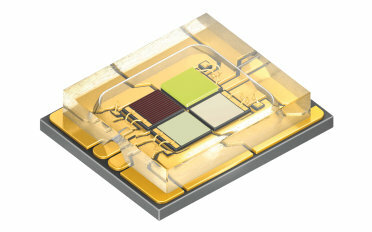 OSRAM OSTAR® Stage is equipped with four high-current chips based on the latest thin-film and UX:3 chip technologies. 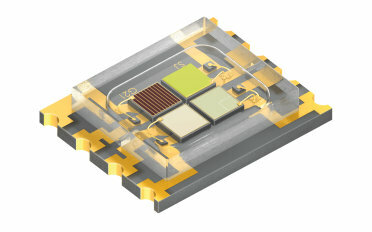 With an area of 2 mm² each, the chips are twice as large as the previous ones but at 5.7 mm x 6.4 mm x 1.3 mm the package size is only slightly larger. 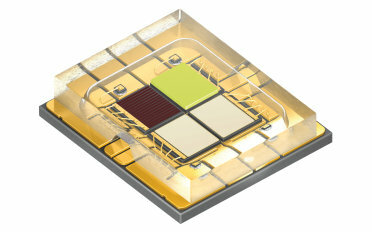 Thin-film chips in red and UX:3 chips in green, blue and white are used.